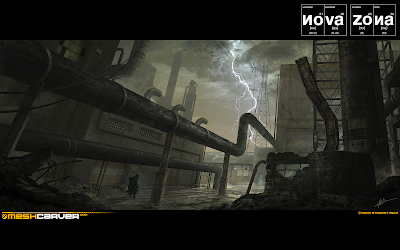 Well, here's what is definitely going to be my last update before I go back home to chill for 9 weeks- another atmosphere/touchy feely piece to get across the mood for one of NOVA ZONAs many Industrial areas scattered across the island. Again, it is to show things like weather/forms/lighting/atmospherics and overall tone, and is not intended to be taken as a literal shot. Although, saying that, just doing these two pictures has given me a lot of ideas and is also helping keep me on the right track design wise- as it's so easy to go off on a tangent otherwise, so I might do some more of these further down the line. Extensive piles of rubbish and debris, huge tall over bearing structures breaking up the skyline, electric pylon wiring and mist patches will all add up to create an atmosphere of dread and foreboding in the right weather conditions so I'll try my best to get those all in and working too. Worth mentioning is that I got a considerate PM from Ceh (Bohemia Interactive forums) who pointed out that my logo for NOVA ZONA is in effect incorrect..! I think because the [I]"N"s[/I] are reversed it seems like Cyrillic, and so is an incorrect spelling unknown totally to me. He is suggesting numerous fixes/advice etc which is completely welcome but if anyone here is also in the know, PLEASE let me know how I could get around this issue, and if it's an issue that is too much of a mistake as to be unacceptable basically. Like saying North America is only 2 miles from Britain or something... but if it's still sort of acceptable, then I'm prepared to swallow it and go ahead with it how it is as I really like the look and feel of the logo- it's exactly what I was trying to achieve. UPDATED: The NOVA ZONA logo is now correct. Ceh sent me some amazing advice about Cyrillic variations and I've applied what he suggested basically, so a big thanks to Ceh..! Wouldn't have happened without him. I've left the main NOVA ZONA in large fonts untouched as I really like the look and it's more appealing to us "Westerners", but the Cyrillic spelling has been added underneath and just adds another layer to the Periodic Elements look. Stunning work. Looking forward to your return! One russian community about ArmA 3 posted a link to your page with those interesting arts. They are look great. Now about logo. Reversed "N" ("И") is correctly spelled as "ee", so, your logo spells like "Eeova Zoeea". In russian language, "N" is equal to "H". About atmosphere. I feel influence of soviet 1950s, when Stalin was alive and so were alive his giant projects. Can't wait for that map. Good luck with it.